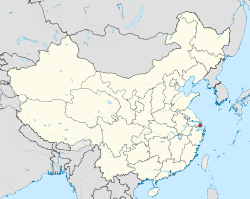 Shanghai (Cheenese: 上海; pinyin: Shànghǎi; Shanghainese: Zånhae [z̥ɑ̃̀hé]; Mandarin: [ʂɑ́ŋxài]) is the maist populous ceety in Cheenae an the lairgest ceety proper in the warld. A global ceety, Shanghai exerts influence ower commerce, finance, cultur, airt, fashion, research an entertainment. The ceety is locatit at the middle portion o the Cheenese coast, an sits at the mouth o the Yangtze River. Ance a fishin an textiles toun, Shanghai grew tae importance in the 19t century due tae its favourable port location an as ane o the ceeties opened tae foreign trade bi the 1842 Treaty o Nanking. The ceety flourished as a centre o commerce atween east an wast, an became a multinaitional hub o finance an business bi the 1930s. [deid airtin] Efter 1990, the economic reforms introduced bi Deng Xiaoping resultit in intense re-development an financin in Shanghai, an in 2005 Shanghai became the warld's lairgest cargo port. The ceety is a tourist destination renouned for its historical landmarks such as the Bund an City God Temple, an its modern an iver-expandin Pudong skyline includin the Oriental Pearl Tower. Today, Shanghai is the lairgest centre o commerce an finance in mainland Cheenae, an haes been described as the "showpiece" o the warld's fastest-growin major economy. The twa Cheenese characters in the ceety's name are 上 (shàng) 'abuin' an 海 (hǎi) 'sea' which thegither literally mean 'Upper Sea'. The earliest occurrence o this name dates frae the Song Dynasty (11t century), at which time there wis awready a river confluence an a toun wi this name in the aurie. There are disputes as tae exactly hou the name shoud be interpretit, but offeecial local histories hae consistently said that it signifies 'The upper reaches o the sea'. Due tae the changin coastline, Cheenese historians hae concludit that in the Tang Dynasty Shanghai wis literally on the sea, hence the oreegin o the name. Anither readin an aa suggests the sense o "go ontae the sea," which is consistent wi the seaport status o the ceety. A mair poetic name for Shanghai switches the order o the twa characters, Hǎishàng (海上), an is aften uised for terms relatit tae Shanghainese airt an cultur. Shanghai is commonly abbreviatit in Cheenese as Hù (simp: 沪/trad: 滬). This character appears on aw motor vehicle license plates issued in the municipality today. This is derived frae Hu Du (simp: 沪渎/trad: 滬瀆), the name o an ancient fishin village that ance stood at the confluence o Suzhou Creek an the Huangpu River back in the Tang Dynasty. The character Hu is aften combined wi that for Song, as in Wusong Kou, Wu Song River, an Songjiang tae form the nickname Song Hu. For example, the Japanese attack on Shanghai in August 1937 is commonly cawed the Song Hu Battle. Anither early name for Shanghai wis Hua Ting, nou juist the name o a fower star hotel in the ceety. Ane ither commonly uised nickname Shēn (申) is derived frae the name o Chunshen Jun (春申君), a nobleman an locally revered hero o the Chu Kinrick in the 3rd century BC whose territory includit the Shanghai aurie. Sports teams an newspapers in Shanghai aften use the character Shēn (申) in their names. Shanghai is an aa commonly cawed Shēnchéng (申城, "Ceety o Shēn"). ↑ "Land Area". Basic Facts. Shanghai Municipal Government. Retrieved 19 July 2011. ↑ "Water Resources". Basic Facts. Shanghai Municipal Government. Retrieved 19 July 2011. ↑ "Topographic Features". Basic Facts. Shanghai Municipal Government. Retrieved 19 July 2011. ↑ "OECD Urban Policy Reviews: China 2015". OECD. Retrieved 2015-05-01. ↑ 《2013中国人类发展报告》 (PDF) (in Cheenese). United Nations Development Programme China. 2013. Retrieved 5 January 2014. ↑ "A Glimpse at 1930s Shanghai". Yoran Beisher. 2003-09-24. Retrieved 2008-03-20. ↑ "Shanghai now the world's largest cargo port". Asia Times Online. 2006-01-07. Retrieved 2008-03-20. ↑ "Shanghai: China's capitalist showpiece". BBC News. 2008-05-21. Retrieved 2008-08-07. ↑ "Of Shanghai... and Suzhou". The Hindu Business Line. 2003-01-27. Retrieved 2008-03-20. ↑ 14.0 14.1 14.2 Danielson, Eric N., Shanghai and the Yangzi Delta, 2004, pp.8–9. Wikimedia Commons haes media relatit tae Shanghai.